The 17th meeting of the Shanghai Cooperation Organization (SCO) is being held in Astana, Kazakhstan on June 8-9, 2017, where all eyes are on the official endorsement of China's big ticket Belt and Road Initiative (BRI). Importantly, the summit will also formally accept the inclusion of the two South Asian rivals – India and Pakistan, representing a mammoth 1.5 billion population. With their addition to the club, the SCO will roughly represent half of the world population, making it the largest regional forum in terms of population, thereby considerably enhancing its reach. In addition, member states are likely to sign an Astana Declaration and adopt a SCO Convention supporting the global fight against terrorism and other security threats. To ensure these goals, there have already been numerous ministerial meetings and exchanges at senior official levels to firm up key areas of collaboration and cooperation among members representing diverse viewpoints and experiences. Originally named the Shanghai Five, comprising of China, Russia, Kyrgyzstan, Tajikistan and Kazakhstan in 1996, its expanded version, the Shanghai Cooperation Organization (so called since 2000) has evolved into a powerful regional block representing the geopolitically-vital Eurasia region. The SCO has made visible progress in holding numerous dialogues, concluding vital agreements and conducting track-2 diplomacy on pressing issues involving regional conflict, trade, regional security, issues pertaining to regional connectivity, creation of energy groupings, and an SCO Bank among others. While implementations remain somewhat patchy, there is, nonetheless, work in progress. With the presence of regional giants like China and Russia and the coming inclusion of South Asian heavyweights like India and Pakistan, the significance and legitimacy of the SCO can only grow further. The Astana summit holds significance promise as it is expected to formally endorse China's mega infrastructure initiative – the Belt and Road Initiative (BRI). It needs to be recalled that the SCO has been one of the key motivators behind China's BRI idea. No wonder, with the sole exception of Tajikistan, all heads of SCO participated in the recent BRI summit held in Beijing. With China pledging additional resources for Eurasian connectivity, the SCO is expected to give a big push to BRI development. It will be interesting to watch India's response here, remembering that it did not participate in recent BRI summit citing sovereignty issue. What are possible takeaways we can expect from the Astana meeting? While the BRI is going to bring about deeper economic cooperation, in regard to its traditional forte – regional security and terrorism – we can expect forward movement on security cooperation and adoption of tangible measures. Nearly all member states, including those in Central Asia, face serious threats from radicalization, extremism, Jihad-inspired terrorism, drugs and gunrunning, and other threats from non-state actors. In this regard, what would come in handy is the work carried out by SCO's Regional Anti-Terrorist Structure (RATS), run by more than two dozen security professionals analyzing vital intelligence and related inputs on terror outfits, their funding, drug-trafficking, cyber threats among other. With terror groups using digital platforms and social media to enhance their reach and effectiveness, this information is extremely critical for member countries. Similarly, SCO-backed counter-terrorism drills and joint military combats should receive greater attention as recent attacks in Philippines and London are a timely reminder. Further, the SCO provides a rare platform for the militaries of India and Pakistan to share multilateral tables, join anti-terror drills and military exercises under the SCO framework. This may have some sobering effect on Indo-Pak relations and regional peace. In short, the Astana meeting is critically poised to transform the scope and purpose of the SCO that used to dabble only in regional security and terrorism issues. While the addition of new members would provide greater visibility and help cement better ties among members, the BRI project would bring greater economic cooperation and accrue tangible development benefits for SCO members. 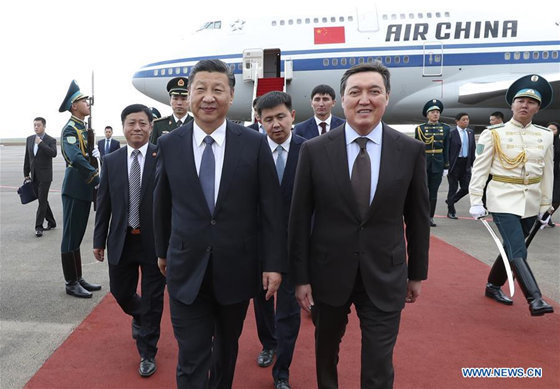 The Astana summit of the Shanghai Cooperation Organization holds significant promise as it is expected to formally endorse China's mega infrastructure plan - the Belt and Road Initiative (BRI).